This meeting was held at the Rochester Mills Beer Company. There were about 50 people in attendance. Jeremy Verbeke and Steve Vigneau chaired the meeting. It was called to order at 7:03 PM. Please note, June 4th the trails will be closed to mountain bikers due to a trail running event. 150 ft board walk over marshy area will be constructed by volunteers from LL Bean funded in part by LL Bean and Back to the Beach. Columbus County Park. 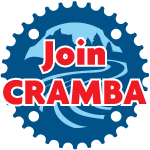 Don Miller III has volunteered to be CRAMBA’s trail coordinator for this trail. Thank you Don! Holly-Holdridge. Cori Chesnutt said the first trail maintenance date is June 10. They may have one prior to that depending on trail conditions and will promote it once the date has been set. Sony Creek Skills Park. Dave Schall has done a good job with cleanup and housekeeping on this younger age usage trails. $39 annual membership will begin June 1, 2017. MMBA is sponsoring an Expo/Festival in Boyne City on August 25, 26, for the expressed purpose of funding our ED’s salary. Good news: due to sufficient sponsor subsidies the cost for an individual was dropped to $100.00 for the weekend. The Expo/Festival will have rides, races, training, etc. 2 volunteers at each trail head – we currently have 29 volunteers! CRAMBA receives 15% of the retail cost. Orders $75 or more will receive free USPS shipping. Currently offering club and trail jerseys. If we get enough orders, we can add more items (like shorts!). CRAMBA pint beer glasses are in and will be available. Balance of $19,509 after pending expenses are paid. Meeting adjourned at 8:04 PM. This entry was posted in Chapter Meetings, Meeting minutes. Bookmark the permalink.